The Center for Art and Media in Karlsruhe lights up with Hörspiel. Today is the beginning of ARD’s Hörspieltage 15. If you’re not a German speaker it probably means little to you, but for the past twelve years ARD’s Hörspieltage has been the largest radio play festival in Germany and the Germans treat it with great respect. For four days, Der Arbeitsgemeinschaft der öffentlich-rechtlichen Rundfunkanstalten der Bundesrepublik Deutschland (ARD) broadcasts not just the twelve radio plays nominated for awards, but also live video streams, concerts, and other reports. And they don’t just broadcast. 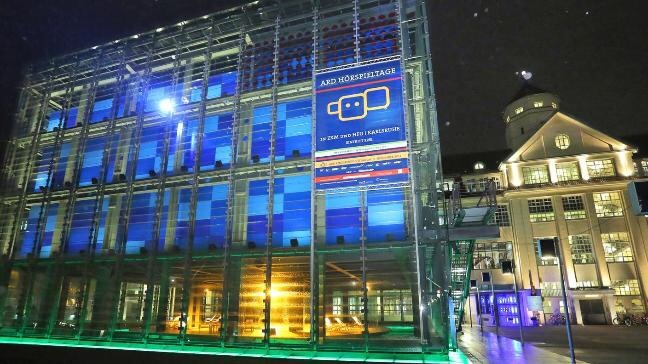 The entire glass building of the Center for Art and Media Technology in Karlsruhe lights up with video projections of each radio play under consideration, as well as partitioning off spaces for visitors to produce their own radio plays on the site. Many well-known producers show up in the ARD-Hörspiel-Box with surprise guests. As the ARD-Hörspiel-Box might suggest, the entire event prides itself on interactivity. Audiences and radio play fans across the country are encouraged to listen in and vote for their favorite play–the glass Hörspiel-Box offers a helpful checklist.. And it’s not just for adults. On Sunday the day is given over to Kinderhörspiel, or radio plays specifically for children. This year’s theme is “The Adventures of Baron Munchausen” which should be great fun. ARD Hörspieltage – 11. bis 15. November 2015 in ZKM und HFG/Karlsruhe. I’ve heard most of the entries, but this is as good a time as any to listen again. It’s an exciting festival lineup this year, and proof that in Germany at least radio drama is alive and well.